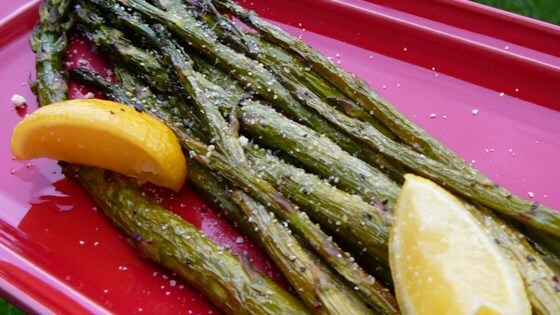 "Great way to serve asparagus, and yummy too." Place oven rack on top third of oven. Place a steamer insert into a saucepan and fill with water to just below the bottom of the steamer. Bring water to a boil. Add asparagus, cover, and steam until barely tender, 2 to 4 minutes depending on thickness. Place steamed asparagus on a rimmed baking sheet. Drizzle with olive oil and roll asparagus spears in oil until they are coated. Sprinkle with ground black pepper and Parmesan cheese. Bake in preheated oven until lightly browned, about 5 minutes. Do not turn or shake asparagus. We love roasted asparagus. I don't know if the initial steaming (blanching) is really necessary. We like our asparagus on the crisp side though. Delicious! Only thing I did was add the lemon juice before baking, because I like my asparagus green. Other than that, this one's a keeper! I made this recipe two ways - one with the blanching, as written and one without. Really cannot see a reason to blanch. The taste is there, and the Parmesan cheese is a nice touch. I make this all the time only I add 4pcs minced bacon and 1 tbsp garlic and only a touch of oil to kick this up a notch. You can skip the steaming step all togeher.